These 10 items will soon be on your list of must-haves for your RV bathroom. Many RV’s lack built-in bathroom storage and accessories. I know my RV bathroom had a lot to be desired when it came to accessories. Many of these items will help you tremendously when outfitting your RV Bathroom. 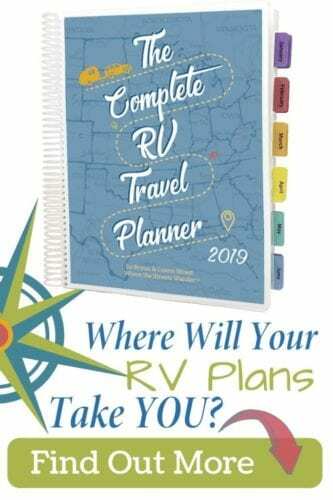 See link in post for a free download of an RV Packing Bundle: Kitchen, Bed & Bath Checklist for your RV! Towels are one of the bulkiest things to store. Often times we don’t have enough room to store enough of these. I splurged and bought Norwex towels. These are not cheap but worth it. They are made of very good micro-fiber and fold up very compactly. You can store 4 x-large towels in 6″ high, 14″ long and 9″ wide of space tri-folded or roll them up to stack another way. They have a sewn loop on one end to hang. They dry quickly( much quicker than a traditional towel) which is important in an RV. Sometimes things take longer to dry in small spaces and these towels solve that issue. These are anti-microbial. Norwex puts silver in their products to reduce the chance of mildew growth and odor. Bryan doesn’t like the texture. I love them! After you get used to the fact that they aren’t your traditional fluffy towels, you will love them too! Storing your toothbrushes in your RV bathroom is a challenge. You can’t leave a toothbrush type cup holder on your countertop to fall off while you are driving. Plus those type of holders take up space no matter where you put them. I use this toothbrush holder in our motorhome. I put it in the medicine cabinet. I really like the hanging aspect so it doesn’t take up much room anywhere and if you do hang it out it the open you can use the cover to keep the brushes protected. Picking the right toilet cleaning system isn't always easy when you have the challenge of an RV bathroom. You want a nice clean potty but you have very limited storage space for a long handle or bulky brush head. Plus you don’t want it rolling around the floor when you are traveling down the road. I have use this nifty disposable system. It does a fine job for the money and convenience. I don’t use the caddy that comes with it. I store the handle in our sink cabinet and the cleaner refills there also. When I use the product and dispose of the ‘brush’ in the trash, I rinse the handle end and wipe it with a paper towel to store again. I am usually more of a reuse-type person but this is one area I choose disposable every time. When we moved in our RV I had a magnifying mirror to assist with makeup application. I wear glasses so I need one to make sure I don’t look like a clown 😊 when I am finished. My mirror was on a stand and awkward to store. I found this suction cup mirror to put on my bathroom mirror that works great! It never comes off when I don’t want it to. I reseal the suction cup when I clean my mirror and voila! magnifying mirror situation solved! Bins are handy inside your bathroom cabinet to organize smaller things and keep them from sliding around and getting disorganized. There are many different types of shapes and sizes of these bins. Pick out some that are best for you. I don’t know how any RV’er can get along without Command products. The work well and give a ton of value along with space saving solutions. Most RV’s don’t have soap dishes, washcloth hangers, shampoo and razor storage already built in. So these items will help you tremendously when outfitting your RV Bathroom. I have these items all throughout my RV bathroom and I am sure if you continued to shop you would find a few more for your unique situation. Suction Cup Washcloth Hanger – this is advertised as a portable drying rack but I like the bigger prongs for better hanging of wet washcloths than the ones that are advertised for washcloths. I have had this item since 2013 in my home shower and moved it into the RV. It is easy to put and stays up! Razor Caddy – Great holder for my razor in the shower. Soap Dish – basic easy to stick on soap dish. It stays where you put it! Shampoo and Conditioner Caddy – Holder for your bottles. I have a wire basket that lips over the shower edge…it works great too! Happy Camper is an organic holding tank treatment. It is enzyme based and eats the odors instead of just covering them up. We put a scoop down the potty after each black tank dump to keep everything smelling fresh. We have used the porta paks before and really like this much better! You can even use this treatment in your gray tank if you happen to get odors coming from there. This product is one of must have items for our RV bathroom. Your RV bathroom probably isn’t big but it can be made to hold all the things you need to use as your experience your RV lifestyle. Comment below with your must-have RV bathroom items! We love to find new things! Need to outfit the rest of your RV? You will love these 10 Must-Have Items for other spaces of your RV! 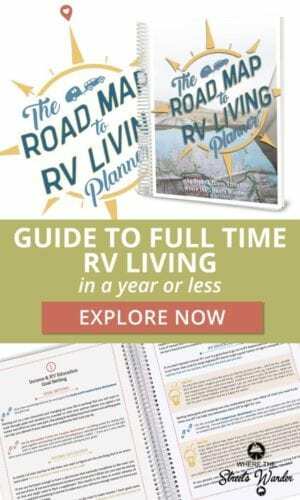 Getting ready to buy an RV? Check out these posts! Thanks for the great suggestions. We just got back from the shakedown trip on our new RV. For the first couple of days we didn’t have hand soap in the bathroom and it was a lot more annoying than I like to admit. It’s amazing how the absence of little things like the things on this list can be so annoying! Bryan, I know right? The most common stuff we take for granted! I hope you enjoy that new RV! I have come to rely on a three way mirror in our bathroom at home for many years to make doing my hair much easier. Any ideas for how to put one in an RV bathroom?? I haven’t seen any in any of the RV’s we’ve looked at over the past year (and we have looked at many). We purchased a Class A and it only has a one view mirror and the door to the medicine cabinet. Chris, This can certainly be a challenge. 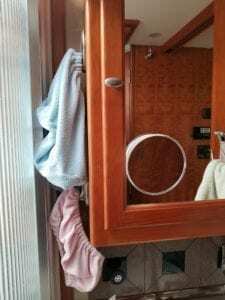 If you don’t have counter space to set it on then another option might have to be that you take somewhere else in your RV to do your hair or possibly put another wall mirror (behind or beside you) in the bathroom to help with the angles. Let me know what you come up with! Good Luck! 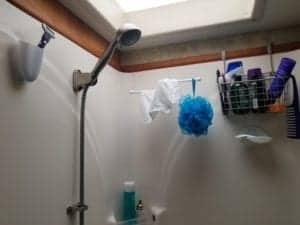 Our motorhome bathroom is very small, and the wire basket hanging from your shower wall lip would really help. Can you tell me where you got it? Anne, I found that at Marshalls. It was a great find! I have a bunch of these I use them hanging over my kitchen cabinet doors that go to under my sink too! Here is one like them from Amazon https://amzn.to/2yj2GDb. Google ‘over cabinet door basket’ to find other options. Happy shopping! We love to put an extra tension rod in the shower to hold extra towels and suits to dry. That is a handy idea! thanks for sharing! Command products have become my best friend. I wish they had all the colors for every product, but over time. I use them for hanging everything and they are awesome for the heat. All my other adhesives come off after staying in the heat for a while. Holding tank treatments are a must as well!! I love these suggestions. I will be using them, but not in an RV. They will be used on our boat! Trying to find help for a boat and storage, etc…is pretty non existent on Pinterest. 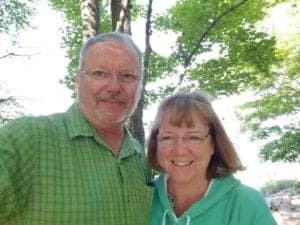 I have come to love the Camping and RV “helplines” Thanks for sharing! Cool! We want to eventually get a boat too! You know 2 vacation homes! LOL We desire to do the Great Loop in a few years! I will have stuff on Pinterest when we do that! 🙂 Tiny spaces are all the same they need ingenuity and organization! Thanks for reaching out! We installed a dispenser for liquids in our shower. Got it on Amazon, less than $20, and it has 3 bottles you refill, install them in the dispenser, and viola! No more fighting the bottles that fall all the time! I like the toothbrush holder, gonna have to get one. Thanks for the tips. I really wanted to do this idea…..but my husband and I both switch between two different shampoos during the week….weird, I know…my only solution was to hand two dispensers and he said no! LOL This is a great tip though!